Black River Entertainment has added singer-songwriter Abby Anderson to its artist and publishing roster. 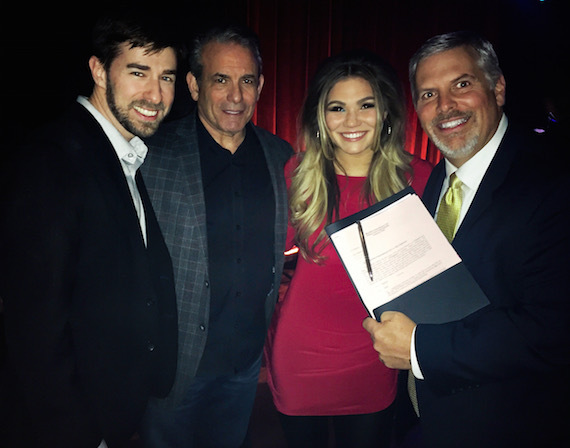 Anderson celebrated her signing on Thursday, Feb. 2, during the Dustin Wells Foundation’s Gift of Music concert benefiting the W.O. Smith School of Music, held at Nashville’s Ryman Auditorium. Anderson signed her formal contracts on the stage at the historic Ryman Auditorium. A Texas native, Anderson spent most of her early years at a piano singing the songs of her favorite music artists: Ray Charles, Dolly Parton, Roy Orbison, Elvis, Stevie Wonder, and K.T. Oslin. In 2014, her unique arrangement of “My Country ‘Tis of Thee,” renamed “Let Freedom Ring,” caught the attention of radio journalist/host Glenn Beck who welcomed her to perform the patriotic song on his show, garnering her national attention. With the encouragement of CAA agent Kylen Sharpe Anderson moved to Nashville in February 2015 and began developing her songwriting and refining her sound.